Writing can be a lonely art form. We sit with our computers or empty notebook and wait for inspiration to hit us. We become affixed to our need to create. To leave something tangible, meaningful, and valuable behind when we depart this life…but we don’t have to go close ourselves off in order to be a successful and fulfilled writer. We are part of a community of artists. Joining with others who understand our struggles, celebrate our victories, and tell us the truth even when we don’t want to hear it. 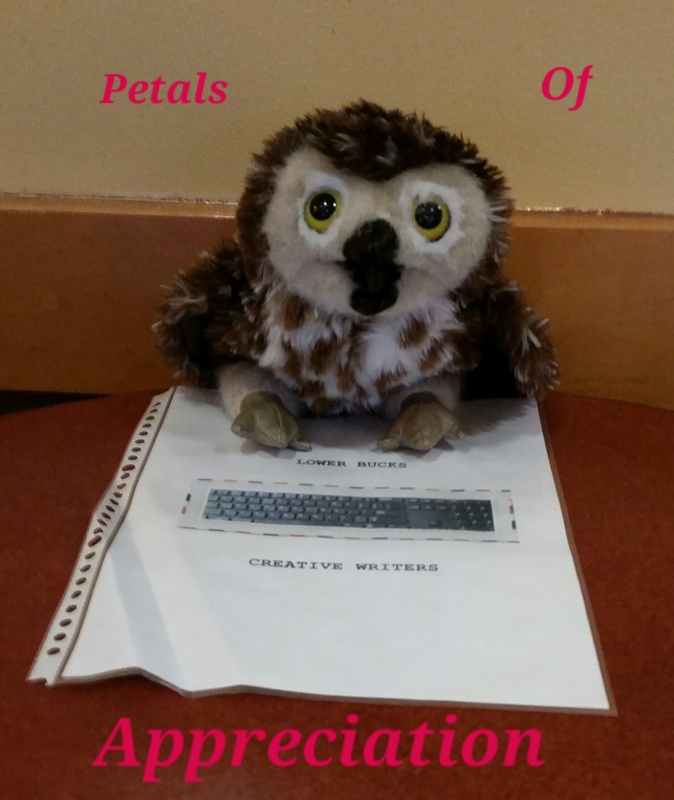 My affiliation with two writing groups changed my life for the better. These groups of artists are the focus of this week’s Petals of Appreciation Campaign. They deserve my thanks today and all the ones that follow. PENNWOOD WRITERS GROUP: With advice from an acquaintance, I realized that I needed some artistic stimulation in my life. So, I found a writers’ group that met at one of the local bookstores. This group of writers met twice a month, offering support and constructive critique to the members of the group. I was welcomed immediately by a woman with a smile on her face and joy in her eyes. I’d found a home that I didn’t know I’d been looking for. We exchanged tips, insights, and advice…but mostly, we applauded our shared love of the written word. Nearly ten years later, the woman who welcomed me is one of my dearest friends. Thank you, Cate, for welcoming me into the Pennwood Writers’ Group, going to Broadway musicals with me, and letting me watch award shows at your house. I love you, my friend! The unofficial mascot of the LBCW. LOWER BUCKS CREATIVE WRITERS: About five years ago, my world shifted and my weekdays opened up. I spent nearly every day at the other local bookseller chain, working on the novel I’d just started, editing the play I wrote in college, and drafting a non-profit business plan. I decided to test my business idea by running a writing workshop based on a specific theme each month. I asked the store manager and she gladly agreed to let me run the event at the store. “You should post it on meetup.com,” she recommended. When I looked into the site, I discovered a place to meet other artists who enjoy writing as much as I do. I formed the Lower Bucks Creative Writers group in January of 2011 and over 100 meetings later, this group of writers continues to flourish. Our member numbers increase weekly and our “regular” attendees shift occasionally, but I am immensely thankful for all of them. I intentionally facilitate the group around the idea that writers need a blend of socialization, feedback, and support from one another. Through allotted time for writing and receiving constructive criticism, writers of all skill levels and genres gather to share our stories. Through this venture, I’ve made professional connections and wondrous friendships. Special thanks go to Doreen, Camille, Maria, Alie, Pam, KC, and other LBCW members! If you do not have a writing community near you, start your own!